TXGuy had the most liked content! Yea, this trip was short, not much time to stop and take pictures. Get to the hotel, see if there was an opening to eat, immediately leave for Downtown Disney. Back, sleep. From the time the alarm went off at 4:00 AM, it was get going to the airport... Man, close to $300 for 10 hours in a hotel... Anyway, same shoes as in previous pictures above. Pushed myself a bit farther on the trip home. I’ve been wearing Clarks light brown leather booties on the plane lately. I guess they can go both ways, they have a 1.5 inch heel. Anyone who would look would know they are women’s. After my trip out last night, I was feeling a bit more daring. 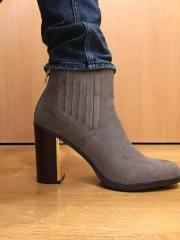 I was thinking over night to wear my Clark’s Mission Alfa booties on the plane ride back. Technically, they are supposed to be 2.5 inches, but my ruler measures 3. I never thought I would wear heels that high on a plane ride, go through security, sit next to people for 3 hours. But this morning I just thought go for it. I have to do it. Everything else was packed away and checked luggage. I figured once I left the hotel wearing the Alfa, there was no turning back. I would have to wear them everywhere for the next 5/6 hours. Felt great the whole way. I’m looking forward to the next trip. I was out again at probably my favorite place to go walking around. Quick business trip to Orlando. Quick trip for dinner to Downtown Disney, which may be Disney Springs now. Thousands of people. Hard to find parking in their huge parking garages...Food was pretty good at Maria & Enzo's. Easy to get a table when there is only one. Most people wanting reservations are in family groups of 3 or more. Wearing the same heels as last visit. There is a market there, but not much in the terms of high heels. Disappointing in that regard..
Am I the only one who has this problem when walking in heels? I have experienced what PleaserFan is describing. At 180lbs, the heels I was wearing did this and how noticeable it was determined by how fast I walked so that the heel was put under tension in that it was slightly closer to the front of the shoe until Intook my weight of. It may that some are better at heel toe in which the heel tip doesn’t flex. I’m not sure if it is the heel that actually bends, or the heel “rotates” toward the front of the shoe at the point the heel connects to the shoe body. The particular heels I’m referring to still look solid in the heel, but they do seem to flex. I’m not sure how many stilleto shoes are designed to be really strong/rigid under a man’s weight(assuming 180 lbs+). I assume shoes are made to support a certain amount of weight, but there has to be a max, otherwise they would be outrageously expensive. I was out on another short business trip last week. A quick in and out with a lot of work with the customer. But I found some time to put my heels on and go take a walk. I posted the pictures of these boots way back on August 10, 2016 in this thread. Man, time is flying... The first night, I just went out to a restaurant near the hotel and then to the local Barnes and Noble. I had work to do back at the hotel for the next day. After that meeting, I drove back to Orlando to stay in a hotel near the airport. I was wondering where to eat, I check the restaurants at Downtown Disney. Or Disney Spring now or something. I check online and saw I could get a reservation. I sort of just dived in and left the hotel where the those boots again, leaving any other shoes in the hotel. Started getting the butterflies when I arrived because the place was packed. They have huge parking garages now and the first one was already full. Drove to the next one, farther away from the restaurant. Got out of the car, joined the crowds and headed to the restaurant. I probably stood out, but not for the heels. I’m wearing boot cut Levi’s, and most people were in shorts. At the restaurant, I was seated out in the middle of the restaurant near a busy walk way, everyone able to see my boots. Sitting down, my jeans rose up way above the heel. Maybe it was just me, but I was getting the idea a bunch of the workers were walking near the table and looking down. I was OK with it, had a great conversation with the waiter. Not about the shoes... Afterwards walked around Downtown Disney. Among litterly thousands and thousands of people. A few hours of walking. It felt great. Why do you love to wear High Heels? The original thought behind the question way back when was for me to come up with a good description that my wife can understand and accept. Putting better words in my mouth as it is. ;) I’ve had many discussions since then about this topic with my wife, and I’ve come to one conclusion. No matter how many ways I can describe why I love to wear high heels, there is no way for her to really understand it. I think of it like this now. I love cars as well, all kinds, especially the ones I have gotten to drive, whether they are mine or not. I’ll call out rare ones on the road and point them out to my son. My wife does not understand that as well. It just does not make sense to her. Hasn't for the last 20 years. For her, or anyone else with no love for heels, it is like a leap of faith to just come to an understanding and accept that I love to wear heels. When that happens, I have no clue. Why do you wear high heels? I’m trying to find better words for why I love to wear high heels. My wife has known about this for years, but has never been comfortable with the idea. I’m wondering if my reasons can be better. Or, is there a better way/better words of/for describing why I want to wear high heels. I put it here in the everyone branch because I think everyone’s opinion is relevant. First, I have a thing for high heels, fetish, attraction, thrill, (lack of better words at the moment) for seeing them, and the experience of wearing them makes it first person vs just seeing with no actual feeling. The desire to wear is not a sexual turn on in itself. Having said that, seeing my wife wear a pair of high heels, the idea of my wife and I wearing the same pair of heels (only imagined up to now ), or her telling me to put on a pair of my heels for an intimate evening alone together (a few times, but love it a lot more…) definitely is a turn on. But my just wanting to put a pair of heels on and walk around is not. The reason for the desire to just walk around is the one harder to get the reasoning across. The fact or experiencing the action of walking in high heels is a definite thrill. More akin to listening to your favorite music live. The live experience creating the thrill. I feel great, I’m doing something that I love to do. I do not want to write too much now. I’d like to hear more other descriptions to see if what you feel may be a better way of describing how I feel. Also for me, I’m not trying to reach my feminine side, or at least no higher than my ankles. I like high heeled boots mainly, but also wedge sandals, mainly for the simple fact that a lot of times it is just too hot for boots. So no other interest in cross dressing, or being gay, I’m straight. But I have no issue for whatever anyone else wants to be. I know there have been other threads. But I think it is good to rehash a topic every occasionally, with the new people that are on any given time. PS, for another topic, but I recently went back in the Men’s branch, started from the beginning and slowly read thought most of the threads. It was a great read, if a long-term project. There were a few similar threads over the years. You can see two other booties I still take with me on trips on the #3 "tab" of this topic. Can't take them all, I need some regular shoes for work. Yea, I'm not into the feminine look. Just the heels. I have a few sandals, mostly wedge, but I have not worn them out heeling. No pumps. When I'm out, I still like wearing Levis and I believe the booties look best. I don't know if slow and steady is the intended approach. My kids do not know, and with them home for the summer limits opportunities. Most of my heeling takes place when I am out of town for work. Which comes and goes. Lately, when I do go, it is LA, Denver, and Melbourne, FL. And the trips have been short, with not that much time for heeling, which is one of the reasons I expanded it to the travel part. if I ever know I'll have time, I shoot you a message to see what's possible.